A variety of landscapes and sceneries with an endless space and settings options are all here for you to accommodate an intimate engagement of 100 attendees or a grand wedding of 500 guests. Plein Air facilities have been built on 5000 m2 distributed between a lavish garden, an elegant open air banquet hall, pool area and banquet buffet tent. 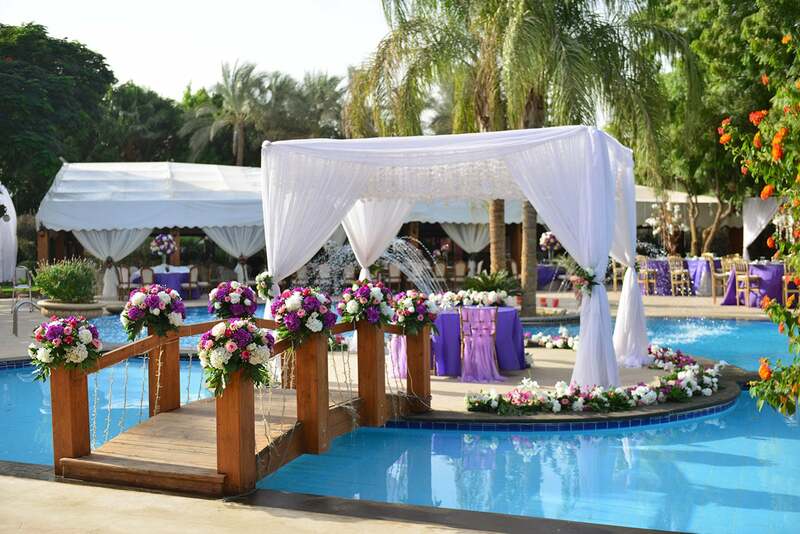 The open Air area is providing a rich landscape with palm trees and flowers, a magnificent wooden Gazebo with a tropical style greenery back ground. Our open air banquet hall offers fantastic scenery and ambiance, giving you a variety of atmosphere from a joyful colorful day wedding to a romantic glamorous night wedding. The garden has a landscape of 3800 m2 evergreen trees, plants & well shaded gazebo. It accommodates up to 200 persons banquet style. It suits also katb ketab, lounge and reception set ups. Decoration lights, candles and a fabulous sunset can create a really magical feeling to your ceremony. Also, our wedding garden site varies in size, and you can manage the space for big or small number of invitees. The garden, alone, can accommodate up to 200 persons. If inclement weather should occur, we have a backup plan. 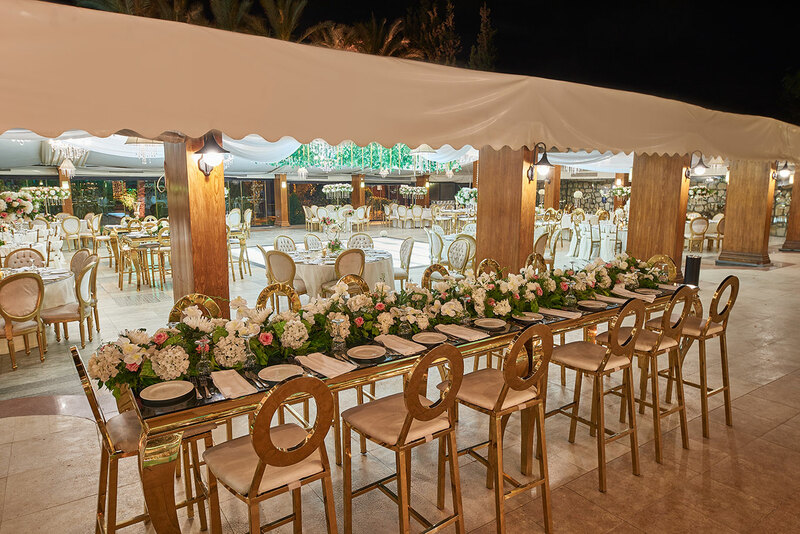 The wedding venue’s event planning team can easily relocate the outdoor ceremony into the indoor banquet hall space in minutes, taking advantage of the splendid décor of the venue itself, while mixing in floral and greenery décor, So don’t worry about the weather. Plus, portable cooling and warming units can create a very comfortable atmosphere for all of your guests in any season. Are you seeking for the luxury and the fabulous look and feel of the elegant style and design of the indoor wedding venues ? Plein air introduced a new concept of an Open Air Banquet Hall & Full Service Management Villa with Indoor & Outdoor Facility. This concept gathered all benefits of Open Air & indoor ballrooms in one place for hosting luxurious events. It also achieved the Villa privacy with 5 stars hotel management. Our tent represents an elegant banquet hall. The tent is beautifully paved with marble, decorated with Teak wood pillars and a water proof white leather ceiling. It is totally closed by the state of the art mobile glass walls that could turn the indoor banquet hall, in few minutes, to an open air shade. The glass wall keeps the banquet hall warm or cool according to the need while allowing the guests to enjoy all the surrounding view & landscape. When open the tent area becomes the extended shade of the garden. The tent is provided with a central air-condition, heaters and fans in order to give you reliable comfort in case of any unforeseen weather change. The tent is fully equipped and has a built in enlightened plexi dance floor, kosha, glass tables, lighting system, luxurious chandeliers, projector & screen as well as the sound system. The banquet hall covers an area of 450 m2. The tent accommodates up to 250 persons banquet style. Our elegantly designed pool adds freshness and allure to the surrounding space. The pool view represents a rich back ground for a banquet set up for 150 guests covering an area of 700 m2. The pool isle and its teak wood bridge and royal palm trees, decorated with flowers & lights is always a romantic choice for katb ketab ceremony, first dance, cake cutting and candle light dinner for the bride & groom. As a well-established wedding venue, we have a professionally designed and furnished space of 300m2 for the buffet display. 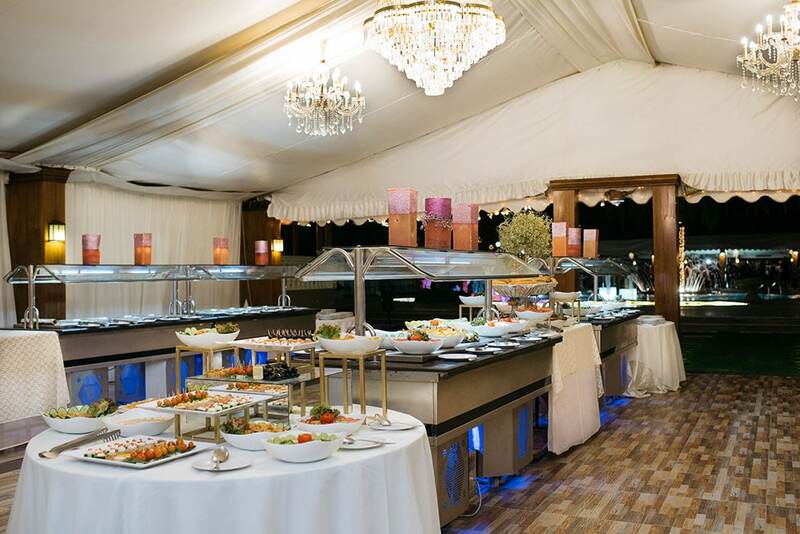 The buffet tent is equipped with built in buffet heating and cooling units to allow food presentation in the most stylish and convenient way. 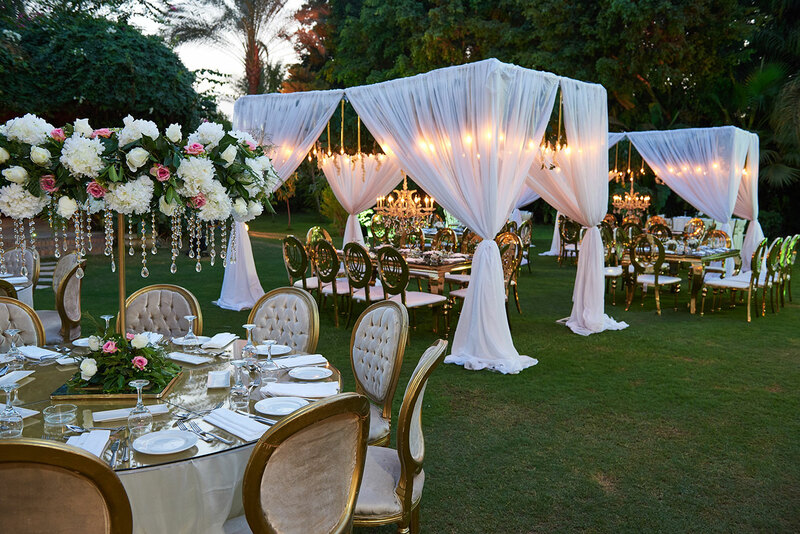 • An elegant shaded terrace of 150 m2 suitable as entrance or katb ketab ceremony.